I remember my first beer, a Milwaukee’s Best, cooled within, and consumed alongside a Midwestern creek. I recall the campsite as being beautiful, but The Beast was awful. Only a couple years later, I was drinking Bell’s from my native Michigan and my relationship with beer began to shift. I love beer. I love drinking it, talking with people who do, and supporting the craft beer industry. You could take away coffee, pie, peanut butter, and even the Taste of Lebanon. But don’t touch my beer, our beer. I am very fortunate to live in Chicago, home to the Beverage Tasting Institute, the Siebel Institute, the Cicerone Certification program, and many, many great bars, shops, and (finally) breweries. Chicago is a global hub for the beer industry. I don’t get everything I want – Russian River comes to mind – but my hopheadedness is consistently satisfied. A short walk down the street and I can buy some of the best beer in the world. Whether it’s sitting at the bar at the Hopleaf or perusing the shelves of La Primera, I am thrilled to explore beer possibilities. Just ask Wes Phillips, my friend and beer mentor, how excited I get when he shows up with a backpack. What other luxury comes so cheap? For $2-$15 I can get sublimity in a bottle, or in a can. Yes, there are some beers that are rare and sell for more, but those are for special occasions. 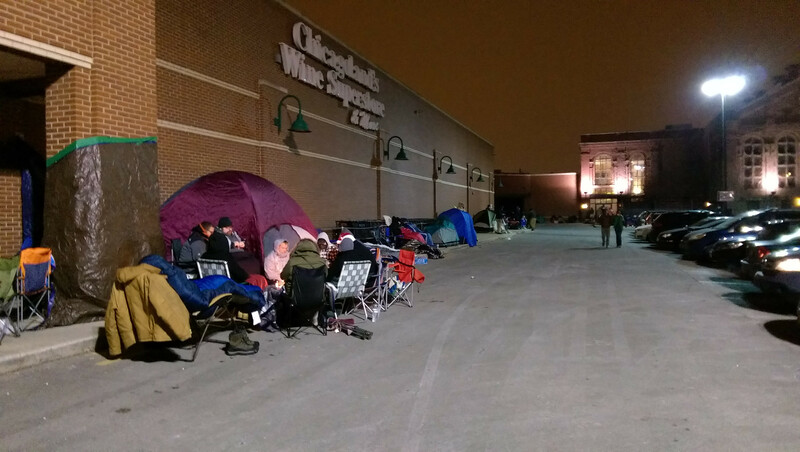 Some people wait in line in anticipation, or even camp in the freezing cold. But “new” or “rare” do not necessarily equal good. Beer is the beverage of the people. It’s accessible in price and beer drinkers love to share their knowledge. I made my first batch of beer in 2001 with two good friends. For our wedding in 2014, we brewed a clone of Pliny the Elder, one of my all-time favorites. The joy of brewing beer is the smell, the mess, and especially watching the fermentation happen. Yeast is crazy. Despite a recent trend of trademark disputes, the craft beer industry is unique in that breweries often share information with each other and frequently collaborate. The brilliant Vinnie Cilurzo openly shares some of his recipes. The brewers of Mikkeller, Stillwater, and Evil Twin do not have their own facilities, but instead wander the globe. Other breweries open their arms and brewhouses to the gypsy brewers and others. A couple years ago Allagash founder Rob Tod visited Belgium’s Cantillon, the world’s preeminent brewer of lambics, a spontaneously fermented sour beer. Cantillon brewmaster Jean Van Roy volunteered to help the Maine brewery set up its lambic-inspired Coolship program. One famous story is of Avery and Russian River recognizing they both had a beer by the same name, “Salvation.” Rather than taking it to the courts or negotiating, they decided not only to leave the names intact, they decided to combine the complimentary brews into a new beer which they aptly named, Collaboration not Litigation Ale. There are nearly 3,500 craft breweries in the United States, more than double the number there were five years ago. I hope that as more money flows into the industry, the spirit of cooperation can continue. I believe it will, as it’s part of the DNA of brewers. They love to talk shop, preferably while drinking. I’ve been privileged to sit and talk with Rob Tod and Omar Ansari. Both of them want craft beer to be successful, not just their own breweries. So, what do I drink? There is usually some combination of Modus Hoperandi, Off Color Apex Predator, Stone Go To IPA, Uinta Dubhe, Surly Furious, Green Flash West Coast IPA, and DirtWolf in the fridge year round. This list definitely represents the hop forward choices preferred consistently by my wife, and often by me. In the colder months, there will be a stout in there as well – likely Founders Breakfast Stout and/or Victory Storm King. In the fall, I love Founders Harvest Ale and often a Belgian dubbel such as St. Bernardus Abt 12. Occasionally, a bottle of Wookey Jack will find it’s way in there too. In the spring and into the summer, I crave the saison style and a sour beer when it’s really hot. We typically have an extra session beer chilling, and at least Stone Saison. Special occasions merit Fantome Saison or the standard Saison Dupont. Speaking of special occasions, there are a handful of ales aging in the basement including a couple bottles of Bourbon County Stout, an Older Viscosity, three Vintage Ales brewed by Unibroue for Trader Joe’s, and Saison Brett by Boulevard. When will I drink them? When they are replaced with something else. Last weekend, I spent the majority of Saturday at an unconference, Cooperation 2015. Three of us – Steve Ediger, Jean Russell, and I – had spent a few months been planning this event, organized around Michel Bauwens‘ visit to Chicago. Here in Chicago, there are examples of p2p already emerging. About 40 attendees from a variety of backgrounds and industries shared their experiences, knowledge, and hopes for the future. The Dill Pickle Food Co-op was in attendance, along with the Mutual Aid Network, and our generous host, the Institute of Cultural Affairs. Throughout the day, we discussed open cooperatives, social cooperatives, open value accounting, time banking, coworking spaces, participatory budgeting, chamber of the commons, open design and manufacturing, WIKISPEED, FairCoop, mutualization of independent workers, commons based reciprocity licenses, and much more. Who is ultimately benefiting from my time, money, and knowledge? The difference between a cooperative, and platform capitalism is significant. For example, the citrus farming cooperative “Sunkist acts on behalf of its farmer members.” When I buy a Sunkist orange, I am more directly helping the people who grow the oranges. Through a CSA I could remove another intermediary – the grocer. In this case, peer-to-peer would be farmer-to-eater. If I buy an orange from a big box grocer, which sources the fruit from a corporate producer, I am supporting at least two sets of shareholders. Though we are starting to see a shift in who companies ultimately choose to serve, the dumbest idea in the world still lives on – that companies exist to maximize shareholder value. The low price I may pay is at the expense of the farmer or grove worker. When I pay for efficiency, I sacrifice my relationship with the earth and the farmer. I’m more removed from my food, and the people working with the land suffer. Peer-to-peer empowers more people. It also brings us closer together as we connect to each other, often without the comfort of hierarchical relationships. Openly negotiating roles and exchanges of value may feel “messy,” but it reveals our interdependence and helps us see more clearly the contributions of everyone. There are examples of peer-to-peer become more significant in lending, banking, food, journalism, technology, and governance. Together, Buffer, Semco, Morning Star, Valve, Zappos, Supercell, stretch across three continents, employ 100,000+ people, and bring in more than $20 billion per year. What do they have in common? They all have transitioned to alternative governance models. Whether it’s going to a boss-less work environment, or organizing a workers’ cooperative, peer governance can really work. After five days of Michel sleeping in our guest room and an inspiring unconference, what do I take away? By adopting a peer-to-peer perspective, we can bypass some of the burdens of living in a world of broken systems. Otto Scharmer refers to these as divides – ecological, social, and spiritual/cultural – that lead to systemic disconnects. There’s no need to wait. Peer-to-peer is open and free. Is value being fairly distributed? Is power being fairly distributed? Are all the stakeholders being considered? What can be shared freely and openly? I can ask these questions for my own company, community, and whenever I have a need or something to offer. Fair does not always mean equal, but it’s always a question worth asking. For the last question, I’m pondering what it is that I want to contribute to the commons. I’ll keep you posted. I’m thrilled with how much my awareness grew in the last week, and looking forward to connecting with others who can amplify what we are doing, learning, and dreaming of together. It’s the end of February. We want the ice to melt, the trees to bud, and to smell the wet new life of spring. It’s the time of the year when anticipation builds, waiting for the time of Via Transformativa when we move from restless, creative dormancy to animation. I am waiting, too, to hear the crack of the bat and the “thub” of the ball hitting the mitt. I can already imagine walking up the tunnel and seeing the green grass for the first time of the season. Each year it brings me a chill and a smile as wide as Bagwell in the batter’s box. Another beginning, another cycle of hoping. I played baseball competitively from the ages of seven until eighteen. As kids, my brother and I played stickball in the street, practiced hitting bottlecaps with broomsticks, and eventually built a backstop in our back yard out of railroad ties and chicken wire. Neighbor kids would show up on Saturday afternoons for pickup games. I collected, traded, and sold baseball cards. I was paid $15 a game to umpire little league. From April until October, I was reading box scores in the newspaper, watching This Week in Baseball, thumbing through Charlie Lau’s guide to hitting, and working on my circle change. Some kids played with a hacky sack. We played pepper. I used to mark time by who won the World Series. We moved onto Leonard Street the year Ozzie Smith and the Cardinals won it. Oh yes, 1985. I remember our family roadtrips to ballparks in a mustard colored Westy (no, they were not hippies), hitting five or six games in different cities within a week, arriving early at each for autographs and batting practice. I’ve watched a game in 28 major league parks. I remember being invited into the clubhouse during the 1983 Chicago White Sox “winning ugly” season where I met Scott Fletcher and Harold Baines, and stared at Pudge and Ron Kittle. Thanks, Dad, for pulling that one off. I fell in love with the White Sox that day and have loved them ever since. I remember jumping up and down in my living room screaming when Konerko hit his grand slam in the 2005 World Series. I savor the memory of my dad and I at the ALCS game a week before, where AJ ran to first on the “trapped” third strike. I listened to the end of Mark Buerhle’s perfect game in the alley with a homeless man who had heard the lefty was three outs from perfection and was looking for a radio. After my playing days were over, I drifted away from the game for a few short years. Then, like a catchy Motown tune, it gently nudged it’s way back into my consciousness. We reunited in the spring and I appreciated her more fully. What do I love this great and glorious game? It’s a game of sun and warmth, beckoning me onto the field after a winter of captivity. To see and smell the natural materials of baseball – leather, wood, pine tar, grass, dirt – calls me playfully into nature and childhood. It’s a sensual game. Why does it need to move quickly? Don’t we deserve a sport that does not demand all of our attention? A game that invites us to slow down and enjoy the field, pauses, and a pace of leisure? Baseball’s most thrilling moments — an inside-the-park home run, triple play, or stealing home — are rare. We go to a game never expecting to see them. We don’t need to because thrill is not an essential part of the game. A stolen base, diving stop, outfield assist at home, or double play is grace in action. Being a second baseman and pitcher as a kid, I love the 6-4-3 double play, watching the second baseman catch the ball from the shortstop,spin in midair, avoid the sliding runner, and throw to first in what seems like one continuous motion. No wasted energy, no time lost. It’s beautiful. With 162 games in a season, baseball is not designed as a spectacle. Unlike football in which every week builds up to a single game, professional baseball teams play six or seven games per week. I know that on any given evening while I’m preparing the grill for a cookout, I can most likely listen to a ballgame. The sum of these games create a rhythm that matches the pace of summer. I’m not riveted to the radio. I’m in conversation, or in thought, just enjoying the soundtrack. Baseball is meant to be discussed. Because of this truth, we have a litany of writers who have anthologized the game to enhance all of our discussion. Then we have statisticians, who are more popular than ever. But most baseball fans are also historians. We hand down the mythologies generation to generation. We compare Hank and Miggy. We tell tales of bloody socks and fried chicken. We stretch when we’re supposed to. We read Roger Angell and even George Will. When my son was riding the bus to summer camp at the age of nine, his camp counselor on the bus played a game every day. With baseball cards in hand, he would flip two over on the bus seat, and ask the boys to vote for the better player. Gwynn vs. Ichiro. Mays vs. Junior. The counselor declared the winner. The education begins and the tradition continues. “Baseball has a bizarre effect on writers: it turns them romantic,” as Eric Nusbaum writes. With the dawn of spring training, I know baseball is about to gracefully flow into the background for it’s share of the year. Hope is in full swing. The radio is on. I’m slowing down to relish it.